Check out our up close and personal video to see it in action and keep reading for all the details. As the rumors pointed out, Amazon's color tablet has a 7-inch 16-million color display. Like the iPad, it's an IPS panel, which means it has a wide viewing angle and great color saturation. The resolution is pretty dense: 169 pixels per inch. It's not comparable to the 326 pixels per inch of the small iPhone 4's display, but it's better than the iPad's 132 pixels per inch. The screen is protected by Gorilla glass. The back is rubberized. It only weighs 14.6 ounces, and has only one port for charging. 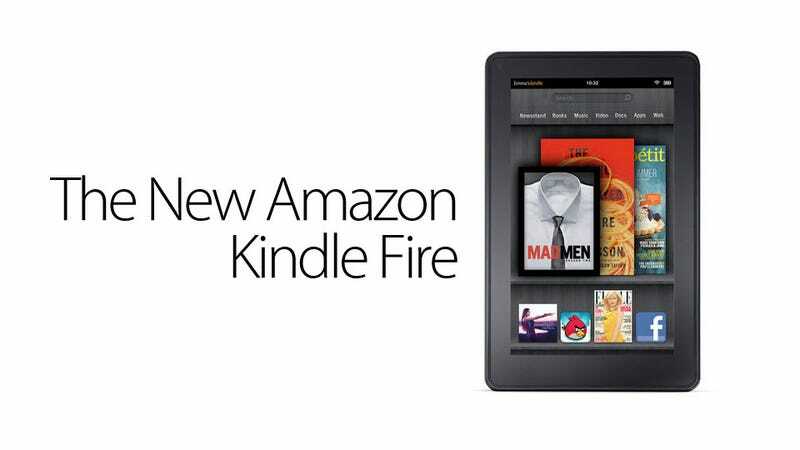 The Amazon Kindle Fire is powered by a dual core CPU and, of course, it has Wi-Fi. All syncing is invisible, wireless and in the background. Users don't have to do updates of any kind. The viewing of content is seamless, meaning that if you are watching a movie on the train through Amazon's cloud, it will pick it where you left it when you arrive home and turn on the TV. It doesn't have cameras or microphone—so no videoconferencing—and no 3G connectivity. Personally, I never cared for those secondary features. It also only has 8 Gigabytes of memory but think of those gigabytes more as cache memory than anything else. This is a true cloud device, where your content lives on the web, and we already know that Amazon has that the cloud nailed. They are probably the best in that business at this point. Learning from Apple, Amazon has put a lot of care in the user experience. When you first open your Kindle Fire, it greets you by your name. It's personalized for you at the factory and it's ready to use with no setup. The interface is ultra-simple, instead of having the horrible Frankenstein that Google and other Android tablet manufacturers insist on getting down consumers' throats. Just a screen to flip through your content—books, movies, music albums and apps—and a simple icon tray for your favorite stuff. The performance is amazing. Matt, Sam and Brent, who are now at the Amazon event, say it's superfast in every regard. The web browser too. They call it Amazon Silk. It is a split browser, using Amazon's EC2 engine for pre-processing and optimizing web pages in the cloud. The EC2 engine takes out any superflous information, optimizes all the media for the Kindle Fire's display, and sends it to the tablet. This keeps memory usage tight. It also features "predictive rendering", which detects browsing patterns and pre-renders the most used pages. It's clever, transparent to the user and, looking at Bezos' demo on stage, it's extremely fast too. But those shortcomings don't seem to me like major show stoppers with this price tag. Even the most optimistic analysts pegged the price at $250. Keeping the price tag below the $200 psychological mark is going to have a big effect in the mind of consumers. Unlike other tablet competitors, Amazon will use its powerful store to sell this tablet. More importantly, it will be deeply integrated with Amazon's cloud services and all its content. It will offer as many books, songs and movies as Apple does. In fact, the Kindle Fire is strongly rooted in all those services. According to Stone's experience, it's a carefully crafted experience, a "meticulously constructed world of content, commerce, and cloud computing." That sounds like a winner to me, but we will see how it really behaves when we try it later today. From what we have read, however, this little device can be a perfect home tablet for consumers at a very low price. The Kindle Fire basically splits the market in two. I can see the low end belonging to Amazon and the high end belonging to Apple. The rest of the players, at least until the Windows 8 Tablets arrive, are basically screwed by Amazon and Apple's combined power. Update: So now we see it in the flesh. The first thing that hit us? This. Thing. Is. Really. Fast. Flipping through the media carousel (your movies, TV shows, magazines, etc) was smooth as Thanksgiving gravy. There's nothing worse in a tablet than a choppy interface, and the Fire seems to be completely chop-free. Swapping between apps—say, going from reading a magazine back to the home menu, or firing up a movie—was very, very impressively fast. Near-instant. It's also worth noting how completely un-Android this Android tablet looks—in the best possible way. Amazon's not exactly a company with a keen design eye; their homepage still looks like it has one leg stretched into the 90s. But the Fire's home screen and sub-menus are detailed without being overwhelming, and simply pretty. For its purposes, Amazon's cooked up something better than Honeycomb. Update 2: Amazon tells us the Fire will have a native email client soon—and it'll support Office docs. So, hey! This thing's a real tablet.